The Hurdy-Gurdy is another creative piece in the line of Ugears. This magnificently designed model brings you the alluring music of the medieval times. This full-fledged musical instrument brings to light the mechanic power and grace of medieval engineering in 16th century France where the Hurdy-Gurdy was a king's delight. The model has a glaring resemblance to the original 16th century Hurdy-Gurdy. This exclusive mechanical model is an all-in-one product that can be used as an elegant exhibitory article, a brain teaser toy, puzzle game and more. Playing this piece takes you to the bygone era. It is easy to play, and you can play notes ranging from modern to folk. UGears Hurdy-Gurdy features intricately detailed exquisite decor that makes this model not only an instrument but an aesthetically pleasing work of excellent craftsmanship. UGears 460 Locomotive with Tender comes with the creative imagination that the hobbyist have come to appreciate in all our models. This model is built to operate in the same way that the mechanical steam engine operates. It is well detailed by showing the process of how the valve and piston transfer power to the locomotive engine by the use of a rubber band and gear system. The UGears Locomotive is built with an eye towards adventure, realism, and romance. It packs the not to be forgotten magical symbols of the 19th Century with its alluring tales of unending fantasy. UGears 460 Locomotive with Tender is an original and welcome gift. You need no glue to put a UGears models together, which makes watching it working and moving even more exciting. It also has a sweet faint scent of wood. It’s assembled without glue like all UGEARS models. Usually we look at a smartphone or a datebook. Manufacturer: Ugears (Ukraine). Assemble without glue like all UGEARS models. The Tanker is designed and fit well for standard 0.33 L cans. Twist the knob on the tanker’s cap and unfold it in surprising way. Self- assembly - no glue required. The combination is unique and can not be used to unlock another Ugears safe. Item model number: Ugears 70011. You can open the safe by entering secret information that is provided with the model. You need no glue to put UGEARS models together, which makes watching it working and moving even more exciting. Richly detailed with an eye toward realism and romance, our version of this indelible symbol of 19th century technology and adventure captures the imagination of all who see it. UGears Mechanical Flower is designed with elegant petals and a ballerina in the midst of the petals with a sweet smelling scent. This is a graceful gift that is meant to drive or bring your love story to a logical conclusion. A ring is well placed at the base of the UGears Mechanical Flower which when turned opens and closes up the petals of the flower. When the petals open up, it reveals a graceful ballerina in its entire splendor that is very beautiful to behold. The Flowery Etui also acts as an excellent place where you can store small items, surprise presents, and even your jewelry. The kit includes two stands of different shapes in the form of Ballerina and the form of Tree of Luck for bracelets, and takes about 2-3 hours to set up this exciting model through the instructional manual that comes with the model. 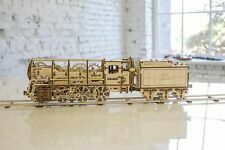 Train UGears 460 - mechanical 3D puzzle ( 443 Pieces wood) Best 2018! The locomotive with the tender "UGEARS 460" is an interesting and rather complicated model of the train. In order to assemble this model, it is necessary to follow the instructions in a step-by-step and step-by-step manner. Trending at C $27.10eBay determines this price through a machine-learned model of the product's sale prices within the last 90 days. Model for self-assembly without glue. You need no glue to put UGEARS models together, which makes watching it working and moving even more exciting. Item model number: 70004. Give us a shot and we will make sure that you will look to us again! Manufacturer: Ugears (Ukraine). It also has a sweet faint scent of wood. Assemble without glue like all UGEARS models. 3D wooden puzzle. Usually we look at a smartphone or a datebook. Paint: Unpainted, Kit do not contain paints. UGears Mechanical Treasure Box is a unique IQ teaser puzzle that has been dynamically engineered to be self-assembled. The assembly kit consists of intricately carved woodwork of the highest quality that is eco-friendly. The delicate carved work of its lid and sides invites you to gain a glimpse into the mystery that the moving gears conceal. Assembling this high precision model is not very difficult, and it can be set up in just a couple of hours following judiciously the well detailed operational manual that comes with the UGears. Laser cutting technology employed for high-level precision and finishes making the dimensions of the parts of the treasure box highly accurate. After assembly, this delicately carved work of wooden puzzles’ lid and sides invites you to gain a glimpse into the mystery that the moving gears conceal. UGears U-Fidgets 4 piece vehicle set is a unique miniature model. The miniature models are a sports car, tractor, truck and a tramcar. Are you experiencing anxiety, losing focus or trying to quit a bad habit? UGears U-Fidgets vehicle could be of help. These 4 unique sets of individual miniature models of a sports car, tractor, truck and tramcar makes a Perfect gift for grown- ups and kids. The part count is 14-18 pieces depending on the vehicle and the assembly time is about 30 minutes. *These sets do not use toothpicks for the assembly. It also has a sweet faint scent of wood. It’s assembled without glue like all UGEARS models. Usually we look at a smartphone or a datebook. Model Size: 4,13 3.9 0.7 in (10,5 9,8 1,8 cm). Elegant petals with Ballerina and Tree of Luck inside. No glue, no batteries needed.Manufactured by: UGEARS. Press out & Assemble Puzzle Kit; no glue, no hacksaw, no battery needed. You're already purchasing the item. UGEARS Aviator Wooden Model for Assembling 3D Brainteaser Adults and Teens Cr. Aviator is the first ever aircraft model from Ugears. Self-assembly, no glue needed. Trending at C $92.26eBay determines this price through a machine-learned model of the product's sale prices within the last 90 days. The UGears Combination Lock is an intriguing model. If you love secrets and conspiracy theories, then this UGears cryptic model is exactly right for you. Dive straight into the world of conspiracy, secrets and cryptography with the UGears combination lock. The 3-digit code allows you to create more than 1,000 cryptic combinations on this model. The Combination Lock consists of two parts. It opens if you set the right 3-digit combination. You can hide the keys, small items and your own secrets inside. The Lock has a convenient “eyelet” to hang the lock on a bag. This sophisticated model gives the feel of real-life motion mechanics that the user can build and bring into action. Your journey into adventure and new discoveries. UGears Date Navigator comes with a 27 year lifespan of new discoveries. This model with its beautiful steampunk planetary mechanism will allow you to see into the future. It helps you to identify and plan your future activities for any date from 2017 to 2044. Just set the year and the month and find out what day of the week it is going to be. UGears Date Navigator can be assembled in less than an hour and no glue is required. Never get lost in time again. Inspired by “The Da Vinci Code”. 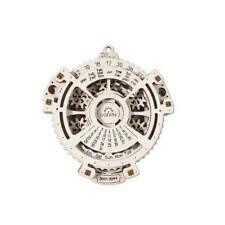 We dived into the world of conspirology, secrets and cryptography while designing our new intriguing Cryptex model. The Combination Lock consists of two parts. It opens if you set the right 3-digit combination. UGears Mechanical Theater is a fascinating and enigmatic model that brings to life the magic of the Theater. This model is a work of art and serves as a great souvenir. When the wheel is spinned you can see how heroes of the theatre like Prince, King, Castle, Dragon, Witch, Jester, The Princess and the Treasure Chest follows each other out. The kit has all you need to assemble the Ugears mechanical theater. The unit comes with a set of high-quality plywood boards with precisely cut-out parts, a detailed step-by-step assembling instruction. The quality and accuracy of the parts are high due to a laser cut method that is employed to manufacture the wood. You can assemble them at home, in the park, or in the office on the table. All you need is your hands, patience, and assembly instructions. No glue is required for its assembly. UGears Mechanical 3D Safe, Valentine's Gifts, Adult Puzzle, Wooden Brain Teaser, Kids, and Teens IQ Game is a classic UGears wooden toy in the form of engaging mechanical model kits and calls for the participation of users. This model of immaculate craftsmanship tasks you to join together several sheets of finely pre-cut plywood to create attractive structures without any glue or chemical. It comes in the form of a puzzle and challenges the owner to enjoy the thrill of solving how to piece this puzzle together to become one, with the help of the instruction booklet supplied with the kit that contains precise information that will guide you all the way through the assembly and installation. UGears Safe is DIY heaven, and it draws its design inspiration from a real life safe closet box. You need no glue to put UGEARS models together, which makes watching it working and moving even more exciting. All you need is your own hands, patience, and assembly instructions. Every train needs a proper station and our Railway Platform is just the ticket. 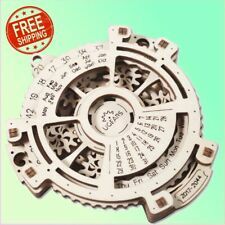 If you like building things, the UGears 3D mechanical Model Timer wooden puzzle for adults, teens, and kids is a perfect fit for you. This exquisite and refined model gives the feel of a real-life mechanism. The Model helps people to understand the details involved in mechanical motion, through the self-assembly of motion models. The estimated time of assembly is 3-4 hours which will help kids and adult to develop logical reasoning during the assembling. Ugears 3D mechanical Model enhances attention and concentration skills as well as improving attention to detail skills. The UGears Timer has a unique roller pendulum and a lever for amplitude adjustment on its backside. It is powered by the pull of a simple office rubber band, and this can be used to set the alarm on this unique piece. Air motor from UGEARS is a small but exact analogue of steam engines. You need just to blow into a special socket or an ordinary balloon and air motor will start working. 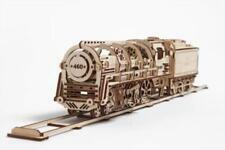 This model is unusual because is made entirely of wood materials. One finishing touch in the design of the Trimaran is a carved tiny seahorse in the bow of the boat. Video will open in a new window. Manufacturer: Ugears (Ukraine). Coloring model "Bee Clock". 3D wooden puzzle. Paint: Unpainted, Kit do not contain paints. It's eco-friendly and healthy. The models are assembled by step-by-step illustrated instruction with explanations in 10 languages. The compact model has a low weight, so you can easily take it with you to parties with friends - if you decide to arrange a real race of retro cars. See photo gallery for the actual item you will receive and it's condition! It is one of the simplest our models to build. In this case the pendulum will not swing but skid;. - If you hold the board with its front side directed to you, it is better to remove the parts by pulling them. Ugears: Tractor - YouTube. EASY TO OPERATE BRAIN TEASER. 3D puzzle for adults is made of high-quality, eco-friendly wood materials. Just follow the user manual provided, and you will be able to install thus engineering toy without any difficulty. The wide back wheel ensures that the model is steady and won’t tip over and turning handlebars send your bike in whatever direction you choose making your ride even more exciting. The Bike VM-02 model kit is made of sustainably sourced high grade wood and has everything you might need for assembly. UGEARS FLOWER 3D PUZZLE WOODEN MECHANICAL JIGSAW MODEL BUILDING KIT BRAINTEASER. Condition is New. Shipped with USPS Priority Mail. Fire Machine - mechanical 3D puzzle ( 537 Pieces wood) Best 2018! Turn the base of the ladder to the right or left using the handle. A special ratchet locks the selected position. After turning the valve, push all three sections of the ladder forward. At the edge of the stairs is a hook to use it as a crane. UGears Tram on Rails is by far one the most romantic models in our catalog. UGears Tram On Rails - YouTube. Manufacturer: Ugears (Ukraine). Coloring model "Horse Swing". 3D wooden puzzle. Paint: Unpainted, Kit do not contain paints. Condition: New in Box. Number of component parts: 15. Catchy design of the theatre with its gears always causes a great interest and enthusiasm during the works process. PRESS-OUT&ASSEMBLE - you do not need glue, hacksaw or battery to put UGEARS models together, which makes watching it working and moving even more exciting. Country of manufacture Ukraine. Model size in finished form: 258 x 84 x 105 mm. Material polished plywood FC. Country of manufacture Ukraine. Model size in finished form: 410 x 235 x 560 mm. Material polished plywood FC. Country of manufacture Ukraine. Model size in finished form: 380 x 135 x178 mm. Material polished plywood FC. Country of manufacture Ukraine. The size of the aircraft in finished form: 145 120 80 mm. The size of the helicopter in finished form: 220 185 90 mm. Material polished plywood FC.